Packing up and moving cities means finding ways to carry my favourite moments with me, not just on my camera roll, to help make somewhere new feel a little more like home. 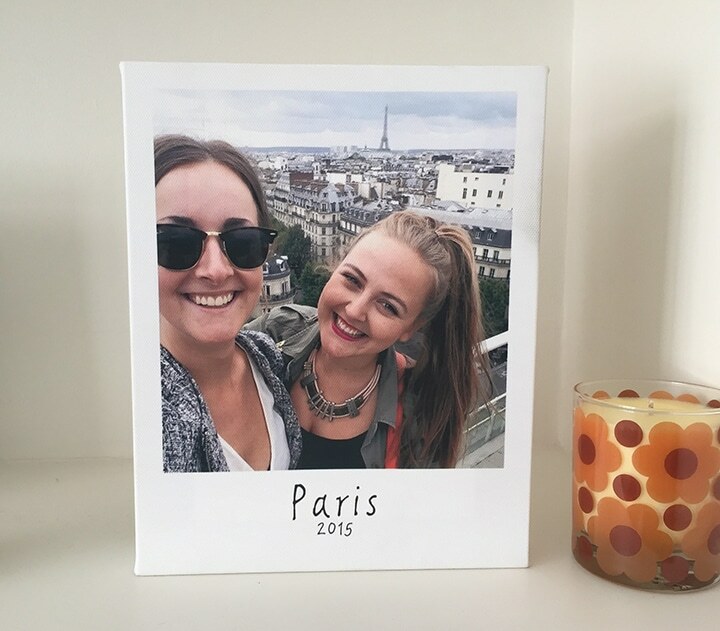 As a lover of Polaroid photographs, I decided to turn one of my photos into a Polaroid style canvas print, all thanks to Snapfish UK. My fabulous friend Emily always has her trusty Polaroid on her, just in case there is a Polaroid perfect moment (& oh boy, there were a lot in Paris) and having had a hysterical weekend when she came to visit me last year, I knew I wanted to savour a memory from this time and recreate a Polaroid for myself. So, after browsing the thousands of selfies we took during the weekend, I chose the one with the cheesiest grins, and of course the Eiffel Tower in the background, to print. I decided on the 10×8″ canvas print, small enough to fit into my suitcase, and used the font ‘Giacometti’ as it makes the text look as though it has been handwritten to try and keep it authentic. And that’s how my memories of Paris stay with me in Rome! All that’s left now is to book your flight to Rome, Em! Shop our full range of canvas prints.